What would you do when you realize that there is a snake in the car you are traveling? Two businessmen from Tiruppur were travelling in a BMW 3 Series GT. They were on their way to the temple city of Madurai in Tamil Nadu. Somewhere on the way, they hit a snake on the road. There was nothing much they could have done to save the Snake. At that time they thought that the snake must have been killed by their car. But that was not what had happened, as they realized a few minutes into their journey. After a few minutes, they started hearing hissing sounds inside the cabin of the car. First they could not believe that it was of actual snake. But when the hissing continued, they realized that somehow the snake they ran over on, had survived and was now in the engine bay – which is where the sound was coming from. They stopped on the side of the road, wishing for the snake to get off. But that did not happen. The hissing continued, almost as if that the snake was angry, really angry. Neither of the car’s passenger got off to check, obviously. They called BMW service center. The mechanic there assured them not to worry and stay inside the cabin as the cabin is built in such a way that not even an ant could enter the cabin if the doors and windows are closed. The driver then decided to take the car to the service center. Watch the video to see what happens next. 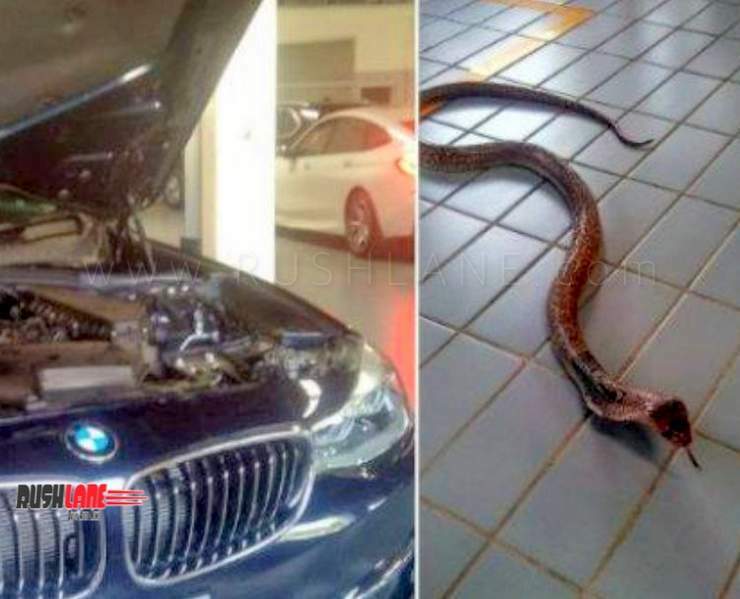 BMW Service Center mechanics were trained to dismantle the car, but they are not trained to handle a snake. So after locating the snake in the engine bay, the people at service center reportedly poked the snake repeatedly with sticks so that it would leave the car. This was not successful, so they then called a professional snake catcher. The professional can be seen in action in the video. He later revealed that when the service center employees allegedly beat the snake, it got injured because of which it was not able to move. Later the snake was rescued and left in the wild.